A few weeks ago I mentioned that a colleague of mine shared with me some insights she had about survey development. 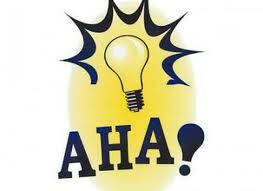 She had an Aha! moment. We had a conversation about that Aha! Moment and video taped the conversation. To see the video, click here. In thinking about what Linda learned, I realized that Aha! Moments could be a continuing series…so watch for more. Let me know what you think. Feedback is always welcome. Oh–I want to remind you about an excellent resource for surveys. Dillman’s current book, Internet, mail, and mixed-mode surveys: The tailored design method. It is a Wiley publication by Don A. Dillman, Jolene D. Smyth, and Leah Melani Christian. Needs to be on your desk if you do any kind of survey work. I thought the video was a nice touch and a way to get the information out through a different source. Thanks, Sam, for this feedback. I’m curious, though, if you could be more specific–like what did you learn? what would help you do your work better? what wasn’t clear. Great Aha! Moments without hesitation. Good work done by the whole team and keep working this hard and well. I follow you closely. Thank you!